Midsole: Compression molded EVA foam, 'Powergrid' perforated foam insert, heel crash pad, firmer density medial post, 8 mm heel to toe drop. 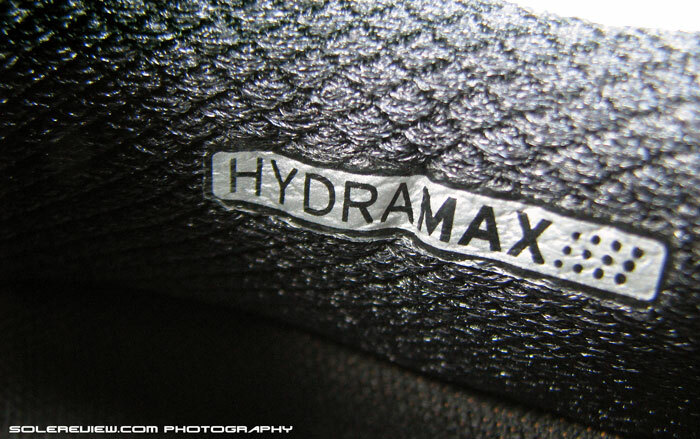 Widths available: M-regular (reviewed), W-Wide, XW-extra Wide. It's got a quad-density foam midsole, but don't let that scare you, neutral shoe seeking runners. The Guide 7 doesn't exhibit extreme motion control behavior, and has a firm and stable, yet cushioned ride. Any red flags? The laces are too long. It’s a pity, really. Just because a shoe is classified as being non ‘neutral’ by a brand tends to scare away a lot of would-be buyers, though the shoe would have worked perfectly for them too. For years, shoes have been classified under ‘stability’ and ‘cushioning’ headings, compartmentalizing product lines by the virtue of how many ’support’ features the shoes packed in. Of late, things have moved towards being a bit more politically correct. Instead of plonking every motion control shoe under ’stability’, brands like have started relying on softer wordplay, using terms like ‘guidance’ and ’support’. Which is a semantic progression of sorts, but at the same time does little to reduce levels of pre-purchase confusion. 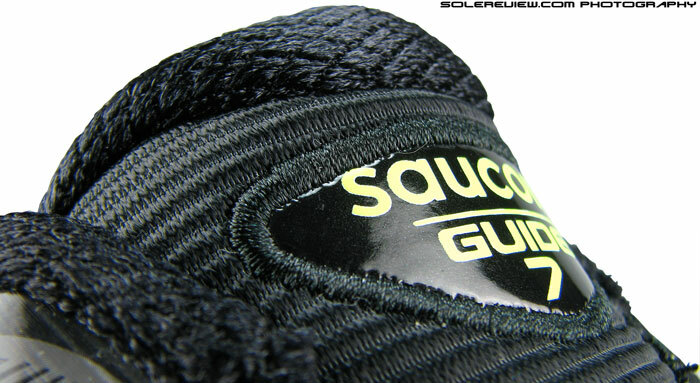 The Guide 7 has a firmer midsole section on the inside. 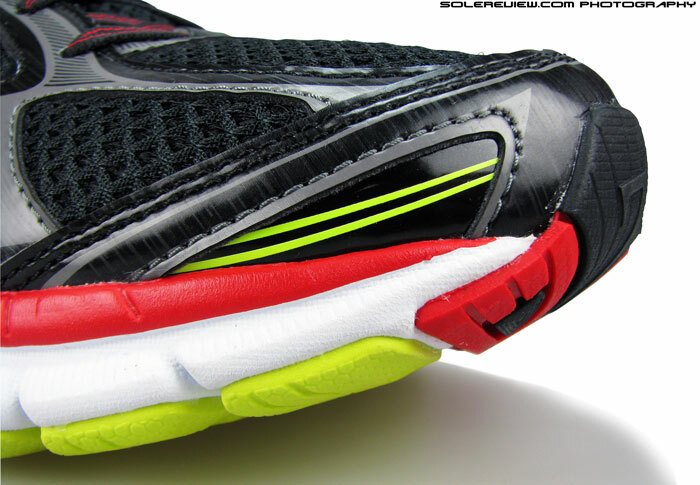 Also, a plastic shank on the medial half of outsole. Saucony’s Guide 7 is a ‘guidance’ shoe (well done with the name, Saucony), and that’s mostly because it features a quad density midsole, among other things. The arch side of the shoe features a firmer piece of foam integrated into rest of the midsole, which happens to be of regular density. 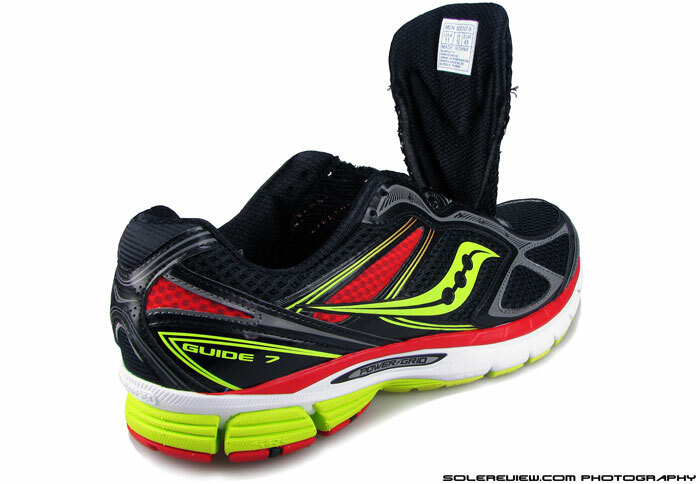 Saucony also tries to differentiate the Guide from the neutral Ride 7 by integrating a plastic shank, and making the crash pad and removable insole a notch firmer. 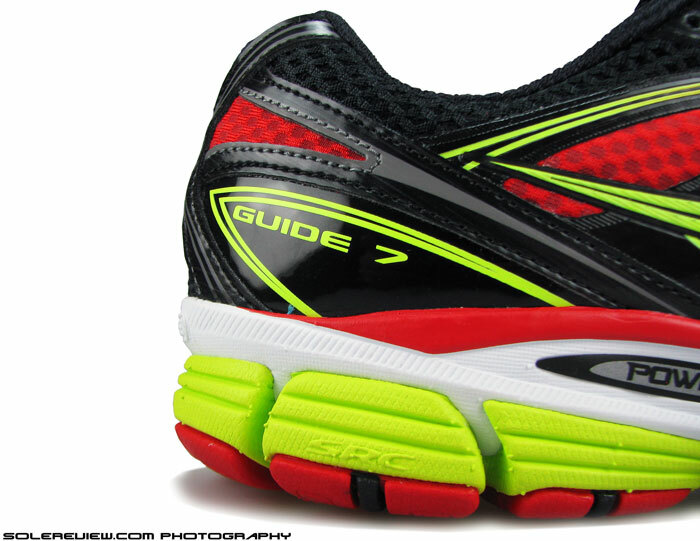 Apart from that, the Guide 7 sole unit shares a lot of common materials with the Ride 7. The bulk of midsole foam has the same density, more or less, and the outsole layout is similar, utilizing identical compounds. The reason why aren’t referencing last year’s Guide 6 is very simple – we haven’t had a chance to wear them. The firmer density foam is integrated into the rest of the midsole foam. It is firm, but not hard. Lateral crash pad. Not soft, but firm. 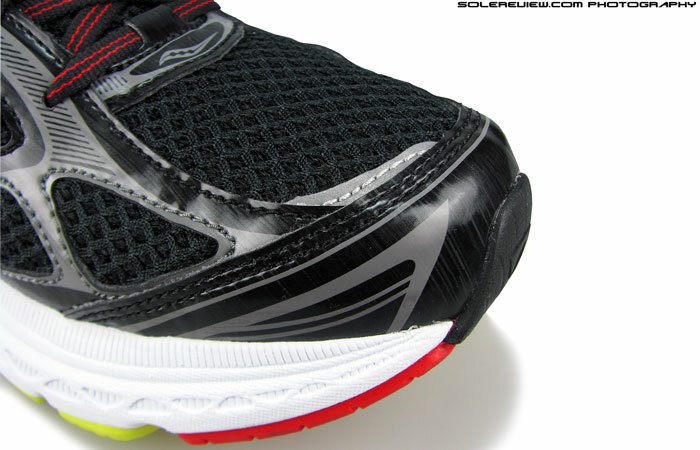 Unsurprisingly, the shoe rides firm, yet its cushioning behavior will be acceptable to most runners. Each foot strike rewards you with a sensation of satisfactory midsole compression, and the inner piece of firmer midsole isn’t rock hard. At best, it isn’t more than 30% firmer than the rest of midsole foam. Actually, its firmness almost matches that of the yellow crash pad on the outer side. This prevents the leaning-on-one-side feeling found in shoes like the Nike Structure 17, and instead delivers a decent level of stability. Somewhat akin to the Asics GT 1000-2 from a ride behavior perspective. The footbed is standard molded EVA variety. 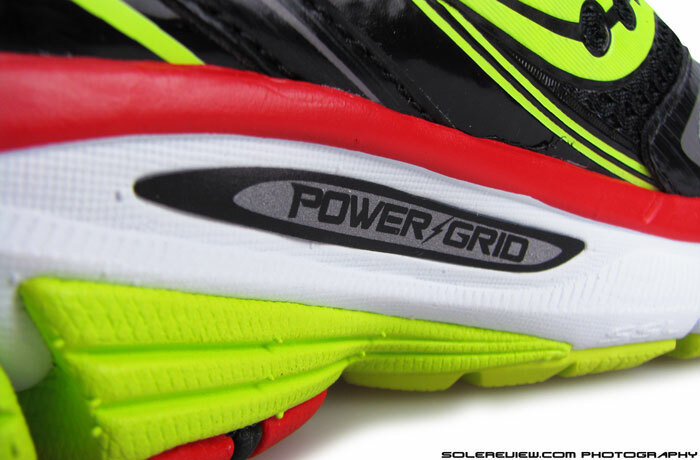 The Guide 7 uses a full length ‘Powergrid’ insert, which is basically a piece of perforated, cushioned foam. That is underlaid over a sheet of foam based strobel, which is topped over with a drop-in footbed, which is a bit firm in density. As you would expect, while the firmer footbed leads to a lesser feeling of immediate cushioning, damping from the Powergrid and midsole foam is delivered as you begin to put miles on them. Arch support from a midsole perspective is average, as the wall doesn’t flare outwards enough to positively impact support. The bright side is that the midsole edge’s wall does not dig-in, helped by the combination of yielding foam and the slight outward curve. While the molded footbed has a built in flare, that doesn’t count for much as the upper mid-foot has a generous amount of slack, and doesn’t wrap beneath the arch so well. The upper heel curves outwards in relation to the outsole edge. Transition is decent, with progression happening gradually. The rear foot is sufficiently articulated, with grooves, bevel and all that. But there’s a small quirk which in most cases, will cause rear-foot strikers to land on edge of the outsole. If you look at the picture above, you’ll notice that the Guide 7 upper has a prominent outside curve, and the outsole sits slightly recessed inside. In other words, imagine a ruler placed flat against the heel curve and placed vertically 90 degrees against the ground. In this case, the edge of the outsole won’t even touch the ruler. This means that foot strike comes later than, say a Ride 7, hence resulting in the runner landing heel-edge first. So if you’re overtly concerned about striking heel vs. late stage rear-foot, the Guide 7 might not be for you. At the same time, we’d like to make it clear that this aspect of the Guide isn’t good or bad, we’re just telling it like it is. Lots of rubber coverage down below. Carbon rubber under heel and blown rubber up front. Forefoot has flex grooves, but is stiff. It could be the Powergrid insert. The outsole life should be fairly good, as there’s plenty of hard wearing rubber on the heel and toe tip, with blown rubber coverage in the forefoot. That also makes the forefoot grip well, which by the way, also feels planted due to ample flare on both sides. Flexibility is average on the Guide 7, with a degree of stiffness felt while bending. But this isn’t a trait reserved exclusively for the Guide 7; most Saucony shoes come across as stiff. Yes, that includes the cushioned Ride 7 and even the 4 mm drop Kinvara 5. The Guide 7 laces are long. Really long. 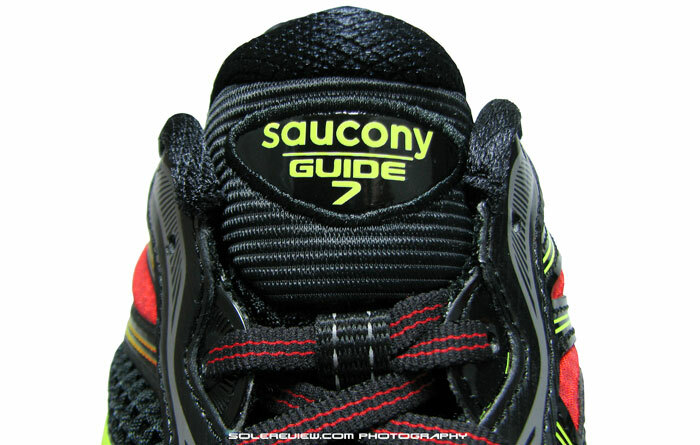 Saucony has a separate section promoting the Guide 7 on their website. The elaborate literature places emphasis on the fact that the shoe was almost three years in the making, and the Guide 7 was its longest development initiative. Well fellas, if you had spent just three hours (not years) of undivided attention on the shoe, one fact wouldn’t be lost on you – that the laces are just too long. Just how long? By conservative estimates, at least 18(!) centimetres longer than they should be. We kid you not, we placed the Ride and Guide (well, that rhymes) laces together. Look at the result above. And we were too lazy to de-lace the Kinvara 5 for a comparison, otherwise the results would border on embarrassing, almost of inter-galactic tethering proportions. Mockery aside, long laces aren’t a good thing. If you tied 7 Guide laces the normal way, forming regular loop sizes, what’s left of it reaches touches the ground. Which means you’ll first crush the lace tips (they’re called aglets) under your sole, and then a succession of jerky pulls will undo the lacing. A safety hazard actually. And if you revise the lacing to form bigger loops, you still lose, as the additional bulk jumps around. One could argue that the Guide 7 laces are flat and stretchy, but hey, Ride 7 uses the same type, so why this difference? Un-gusseted tongue of the Guide 7. Slides too. Another three hours of wear-testing would have also highlighted tongue slide on the Guide 7. As reviewers of many shoes a month, we’re convinced of one thing. That an inner sleeve should part of the default running shoe setup, in the same way every hotel room should provide you with free WiFi, bottled water and HBO. 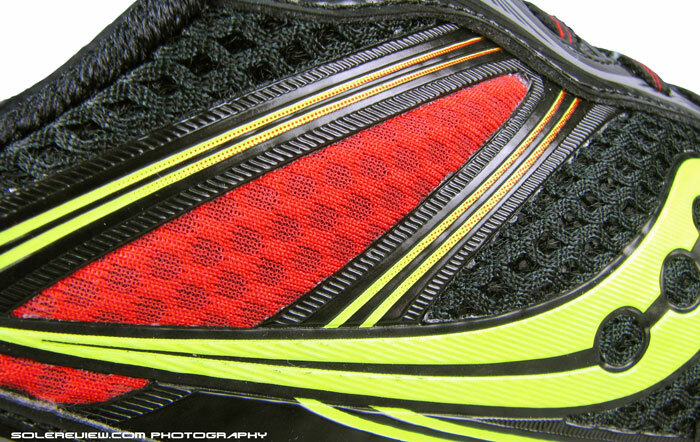 The lightweight Kinvara 5 has a sleeve so why should a more expensive ‘guidance shoe’ be deprived of it? Ok, even in the unlikely scenario of some bean counter in Saucony passing a memo saying that inner sleeves are banned because doing so saves the company $ 100k a year, then at least be innovative. For example, how about moving the tongue-top lace loop to an asymmetrical, medially biased position? Like how the Adios Boost 2 does it. That will minimize tongue slide, and your accountant will purr with pleasure. And by the way, shorter laces save money, just saying. Small piece of reflective element on the toe box. Another blink-and-miss-it reflector on lower heel. 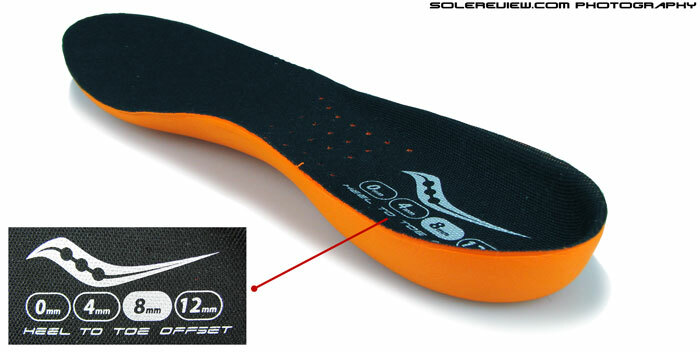 Side reflector on midsole is standard OEM. Coming to the topic of night time visibility, the Guide 7 doesn’t have much of it. 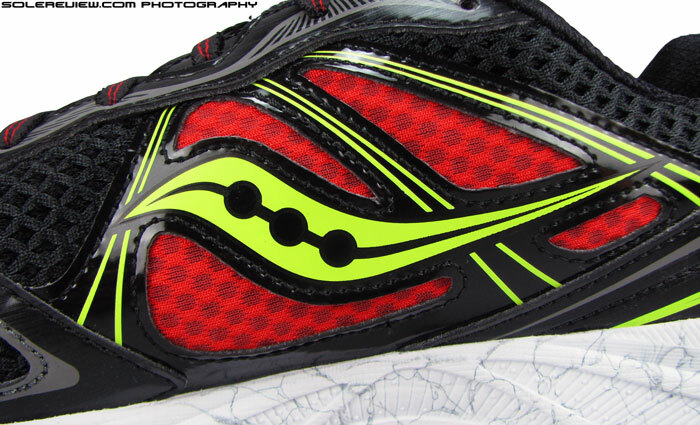 The last Saucony we reviewed was the Ride 7, and the shoe put on a dazzling display of reflectivity. So we were taken aback by the sheer lack of it on the Guide. It is almost if it was last in line on the reflectivity buffet, and was only left with bottom of the barrel scrounging. That translates into small slivers on the toe-tip, heel and lateral mid foot insert – the last one happens to be standard fare on most Saucony models. 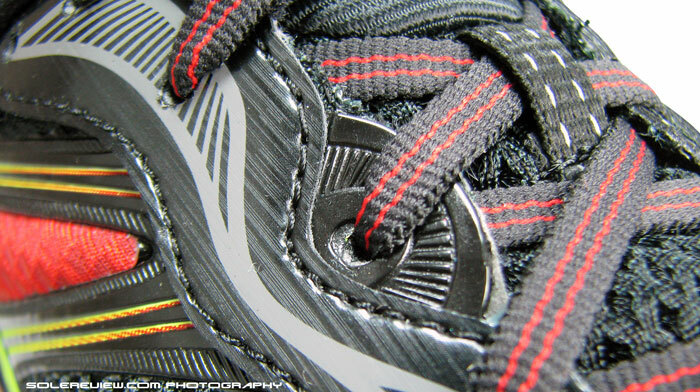 And there is a reflective tongue lace-loop too, which for the most duration will be eclipsed by the laces. …and so is the tongue. Rest of the upper is typical Saucony. The heel collar and Achilles dip is plush, and likewise for the tongue. Mesh is a well ventilated spacer type, overlaid for the most part by stitched-on synthetic overlays. This has a bearing on the forefoot fit; there are overlays on either sides, going over the small toe and base of the big one. Resultantly, the forefoot feels snug on both sides. Vertical toe-box room falls in the median, neither too shallow nor too roomy. Length-wise, the Guide 7 will fit true to size, assuming you have a pair of socks on. 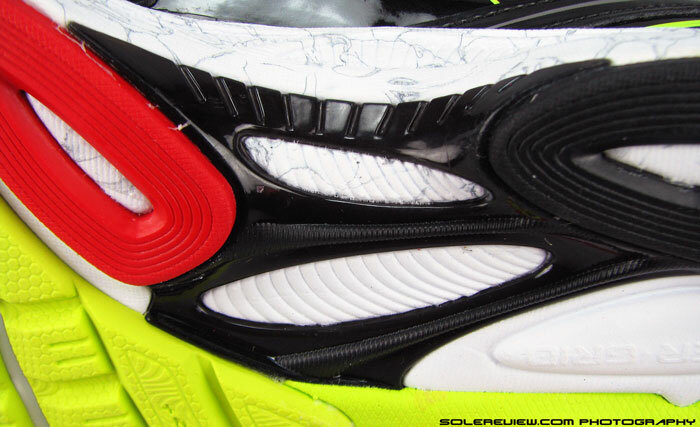 Saucony’s dynamic fit isn’t one, more like static, as the semi-circular eyelets are stitched-on. Makes them immovable, so not much good. The welded overlays on the lateral side which is supposed to create a custom fit. They don’t. 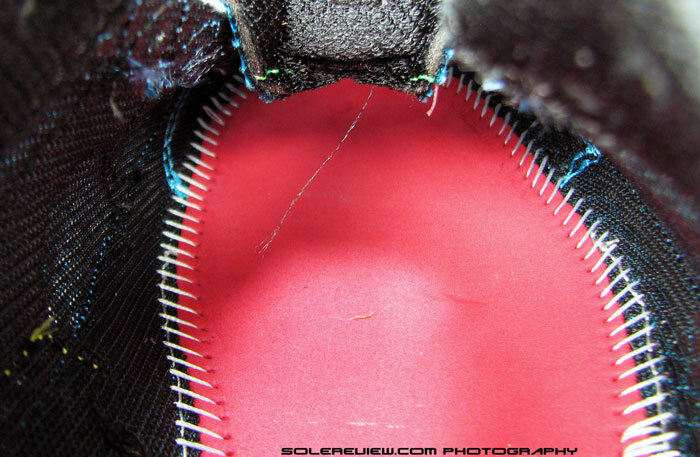 Use of conventional overlays means there are seams inside the shoe. We put some distance on the shoe barefoot, and though initially seams are felt right across the upper portion of small toe (lateral side), it does not result in any blisters or any other post-workout discomfort. Wearing the Guide 7 barefoot opens up some forefoot room, so that helps too. Wear the Guide with socks, and no seams are felt. Saucony mentions use of a dynamic fit mid-foot system for a better wrap, but honestly, we found the so called feature a dud. 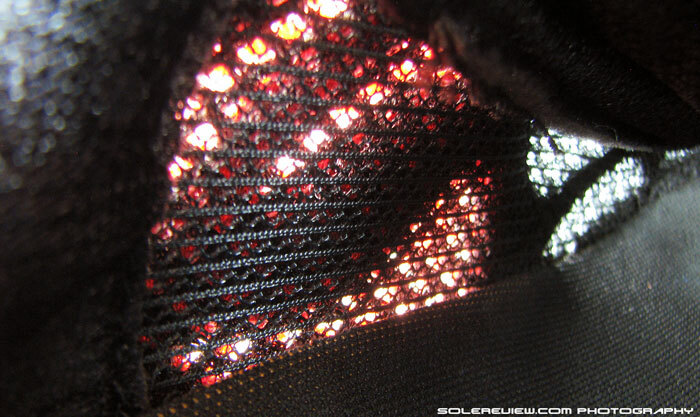 There are these welded quarter overlays in the mid-foot, and they seemingly connect to the lacing, with two half-moon shaped eyelets in the upper section of the lacing. 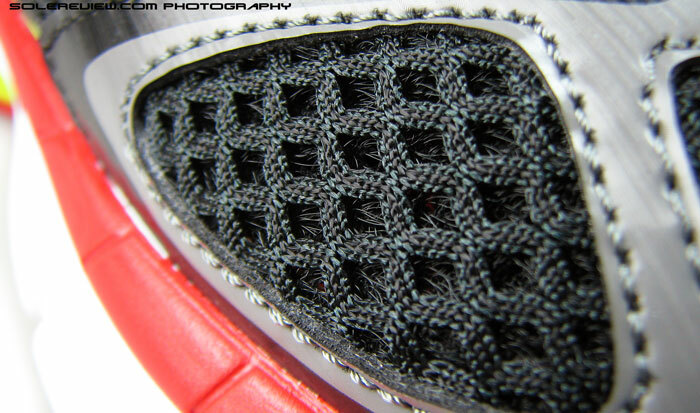 The idea is that tugging on laces passing through these holes should result in a custom fit. But the purpose is defeated, as the lace-loops are stitched tight into the panel, and do not work as independent fastening mechanisms. Also, the welds on the lateral side curve too far rear-wards, so sorry, the whole set-up is more form than function. Saucony has a shoe (Kinvara 5) in which this system works beautifully, but we’ll talk about that in our upcoming Kinvara 5 review. So who should be buying the Saucony Guide 7? Someone who wants a firm, yet cushioned ride in a relatively lightweight package (308 gms/10.8 oz, US 11), but without the overbearing interference of motion control tricks aimed at correcting your gait. Sure, there’s a firmer medial post in somewhere, but the Guide 7 is no Brooks Adrenaline or Beast. So going back to what we said at the start of this review – don’t let the ‘guidance’ tag scare you off if you’re in the market for a neutral trainer. Note on ratings: Our numeric scoring of 8.5/10 is based on a total of weighted averages. The attributes namely transition, stability and fit contribute to 69% of total scoring weight, which we see as more important than material (7%), cushioning (7%), traction (12%) and weight (5%). Hence the scores will not add up when simple average calculation is used. Ran in these for a couple months, one of the only great choices for getting in to a lower heel-drop shoe with strong medial support. There was one niggling issue that I found very hard to explain. Blisters and hot spots along the inside of the big toe. Really more on the side of the toe than the bottom. It’s not due to the upper, the big toe clearly has 1/2-1 cm of room until contact with the upper by examining the toe imprint left on the insole. I think it can be explained by the medial flare of yellow (in your colorway) rubber under the big toe. If you are late stage pronating, and in my case I only do so on one foot, that flare will prevent the sole from rotating and compressing inward to follow the path of your big toe. My fix was to permanently artificially compress the area of the insole between my big toe and the upper, using a pair of quarters on either side of the insole and some locking pliers overnight. This thinned the insole out and lessened the hot spot, but didn’t eliminate it. I was hesitant to cut insole away there, but may do so now that the Guides have been retired to casual wear. Shaving the outside rubber away there could be a viable solution as well. Just something to watch out for if you are a late stage pronator, or have first metatarsals that point towards your second toe and bear an unusual amount of weight on their sides rather than underneath. Thank you for the feedback. It seems likely your own assessment of the situation is the the reason behind the hot spots – since the modifications seem to have alleviated the condition. Oh and the fix to the laces is pretty easy, just skip the second to last eyelet, lace through the last eyelet, then go back to the second to last eyelet for the knot. Uses up the extra lace without placing unnecessary pressure too far back on the top of foot. Thanks for the tip, will help other people reading this. But Saucony should just follow footwear construction best practices so that you don’t have to think of this! Just plain oversight, status quo, not thinking of that as a problem area. Even without a sleeve, the tongue slide problem can be easily fixed. Solereview do you have any recommendations for any cross country (trail) shoes? Because I’m about to have a school meet soon and I heard good shoes shed off a fair amount of time, thanks. Do you need a shoe for XC training or race day? You can train in most road shoes, while race day needs something faster. Something for race day, I’m able to adapt to any running style for shoes, I just need a light shoe that won’t get too wrecked after in finished with a race. In that case, one shoe comes to mind, the Nike Zoom Streak LT 2. Not a pure XC shoe, but more comfortable and durable than all-out, XC flats. Your review stated that the Guide was firm. 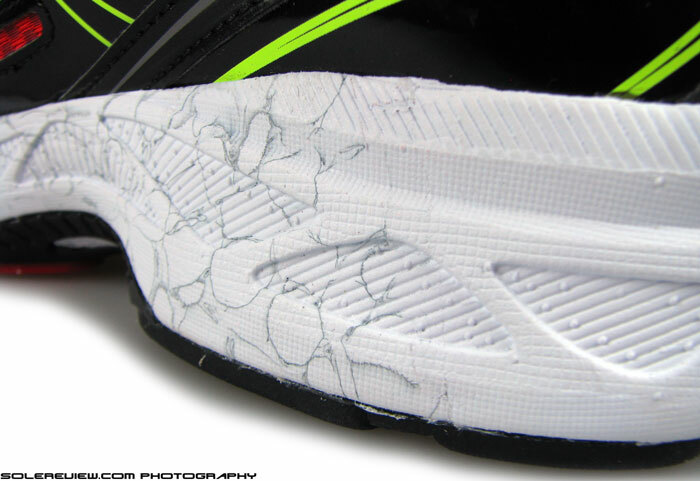 Do you mean the cushioning was firm, like the Structure, or the ride itself (like the outsole is just stiff)? The reason I’m asking is because I used to train in the Structure 17, but I felt that it was too hard on my legs, especially after they were tired from a hard workout. The Structure however did have firm cushioning and firm ride. 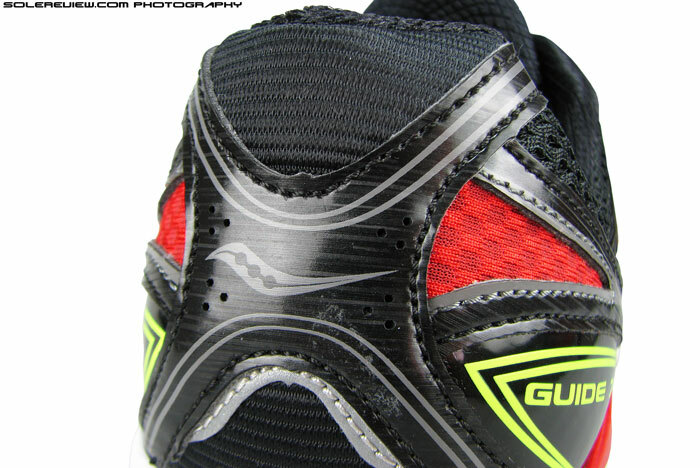 The Guide 7’s midsole is firm, not so much the outsole. 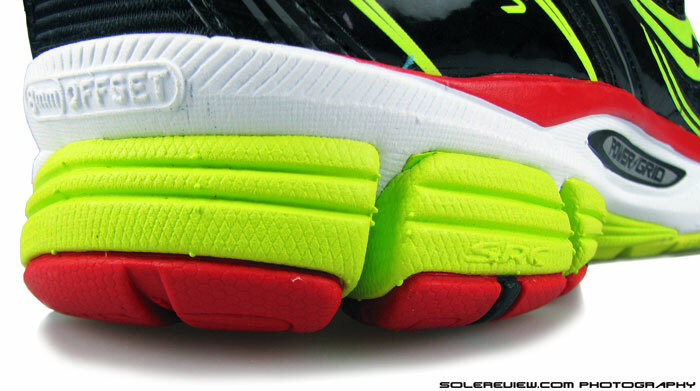 But shoes work in different ways for runners – in fact we felt the Structure 17 to be more softer than 18. Do you feel that the ride is still well cushioned? Though my Structure 17’s are pretty much at the end of their life cycle, since mile 250~ i’ve been feeling like the shoe isn’t cushioned and that I was running with brick soles – but responsive brick soles. If you felt the Structure 17’s to be hard, then it’s likely you’ll feel the same with Guide 7. Great informative reviews. Last year was my first poper year of running and i wore the original Energy Boosts. A few calf problems later and i have orthotics to remedy hallux limitus. Podiatrist recommended trying neutral shoes with a 6-8mm heel to toe drop (specifically Asics but i dont see any that fit the requirements). Any recommendtions? The Guide 7’s are the ones that stand out (and at a reasonable price). We also feel a spacious toe box is important too. Guide 7/8 are alternatives along with shoes like the Ride 7. You can also try the Nimbus 15 (not 16), which is not 6-8 mm drop (it is 10 mm) but with a roomy front. I purchase myself a new pair of guide 7’s for Christmas. Prior to this shoe I owned two pairs of guide 5’s (could no longer find them). Hoped these would fit just as well in the same size but am having a lot of trouble with blisters on the little toes on longer walks – I can feel them rubbing constantly once i get up above 5 miles. Wish a shoemaker would stick with a working design for once. Do repeat buyers really demand they spend a bunch of R&D money to alter a shoe? I’d have been happy to continue purchasing the guide 5’s for life! It is possible that the synthetic leather overlay over the small toe is causing the discomfort. Running shoe updates are a marketplace necessity, regardless of whether runners like the changes are not. Sometimes it is good, and at times it is not. We all have to live with it! I’ve run in a pair of Guide 7s for the past 6-7 months. As a forefoot striker, I found the blown rubber in the forefoot to wear poorly – mine wore down nearly to the midsole foam within around 250 miles, compared to much less wear on a pair of Kayano 19s with similar mileage. (I’m now on my 2nd pair of G7s that are headed down the same path) I love the fit and feel of Sauconys and have even considered picking up a pair of Ride 7s for a softer feel now and then (I’m a pretty mild overpronator and am fairly certain I can get away with a set of supportive neutral shoes) but the fast wear is a real bummer. Wear patterns are subjective to individual running form/weight loading, but we feel that something like the adidas Supernova Glide Boost 6/7 or Sequence 7 will last longer as far as outsole durability is concerned. They fit different, though. Thanks for the recommendation. I’m intrigued by the boost material; might have to track down a pair or two at the local running shop to see how they’d fit. Thanks for the awesome reviews! You’re welcome! Those are worth a fit try for sure.